The quintessentail male garment of the 19th century continued to be worn as a dress garment for Naval Officers in Latin America until the late 1960s. Fitted in the waist with 8 body panels, and with flared "A" line skirt, this garment bears the classic silhouette of an inverted funnel. 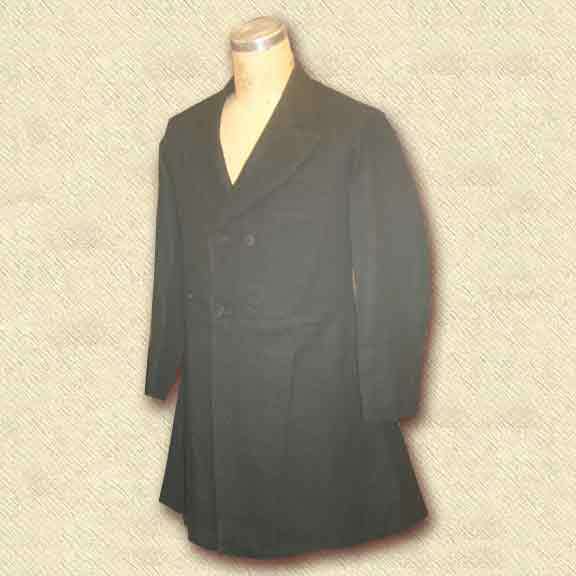 Our frock coat is produced from and original in our collection, solidly dating from the mid 1860's. It features a notched collar with a high gorge line. The pad stitching on the collar and lape are done by machine.. The structured lining is quilted in a pattern that is both decorate and functional. There are three internal pockets, (1 chest and 2 tail pockets).